Good Morning! It's Saturday, and I'm getting ready to tackle some house chores. It might seem 'crazy' to be excited about that, but, it gives me a chance to not think. Not think about work, bills, and other obligations. to just 'do'. No time frame, no restrictions, no requirements. Clean. Well, let me start by apologizing for being late on this post. Linda over @ Our Creative Corner, is our hostess this week. And she wants you to make a paper craft item using Buttons, Burlap & More. Sounds pretty easy. Sounds a bit vintage. I can do this! I knew what I wanted to do in my head. So, I set out to my craft room. Took out my burlap (I have 2 colors) and tried, and tried to make a flower. I couldn't get my burlap blossom just right. It was either too flat, or incredibly too bulky. UGH! now what? So, I decided to use both the burlap and the buttons as accents. My card is pretty much clean and simple, but it has alot of character, without too much stuff. I had two scraps of this beautiful Nostaligia pattern paper left over, and decided that they had the perfect vintage charm I was looking for. Last week, I was tea dying some seam binding. I also frayed both edges to help give it a worn look. I had a few feet left over, so, I decided to add a piece of that. The seam binding is rather wide, a good inch or so. So, to help camouflage the width, I added a scrap piece of crochet trim to the middle. To help 'use' some of that ribbon real estate, I hand sewn some buttons onto the card front with cream twine. 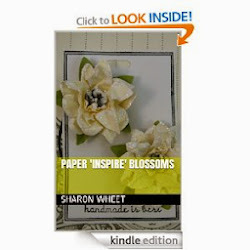 As for the blossom, I have a few beautiful paper blossoms from Prima laying around. So, I added two different shapes and colors of burlap behind the paper blossom. I thought it helped give it a rustic look. I knew that I wanted to stamp the sentiment on the bottom right corner of the card. I also knew that I wanted a large enough type, so it wouldn't look odd, or mis-perportioned. So, I grabbed one of my favorite Paper Trey Ink stamp sets, and stamped the sentiment in basic black classic ink. And since the sentiment mentions a 'heart', I made a heart too. I cut the heart shape out of a scrap piece of Glitz pattern paper and chipboard. Adhered the two pieces together, and then tucked the heart behind my blossom. Thank you for stopping by. I hope we have inspired you to play along with us @ Our Creative Corner this week. 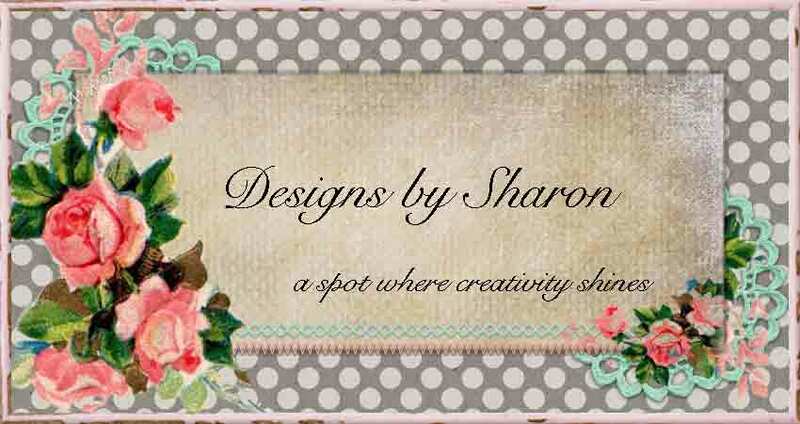 I know we would love to see your wonderfully beautiful creations made with Buttons, Burlap & More! Ok...here goes. The freshness of the bright polka dots and cross cross papers mixed with the old world antiqueness of the grungy heart and chic lace, have me swooning! I love this approach and the combination is so perfect!!! Love lOve love that heart and the pearls!!!! Kudos Sharon!! 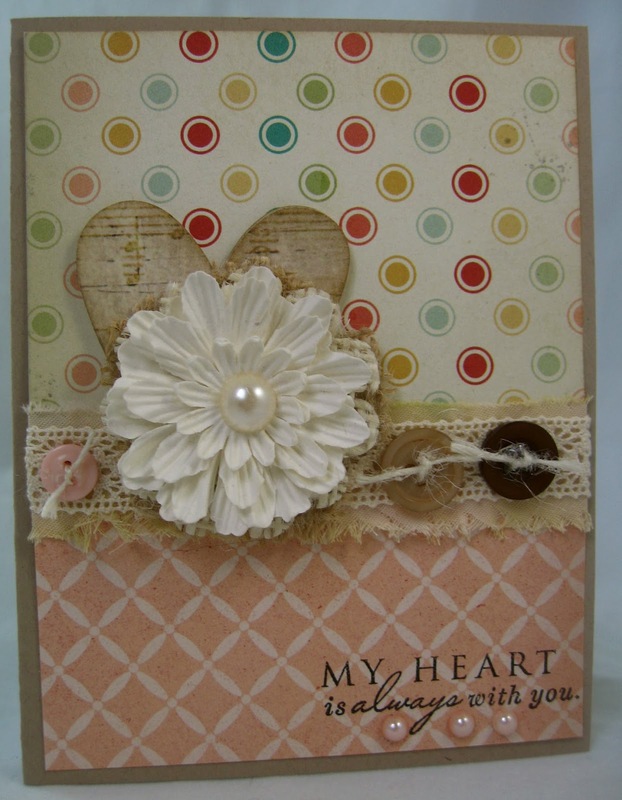 I love this clean style of card Sharon .... it certainly has character and I love the detailing of that layered heart flower and your button ribbon treatment is pretty fantastic too!!! Hi, Sharon, this is such a beautiful card. I love the soft color scheme and beautiful background paper. 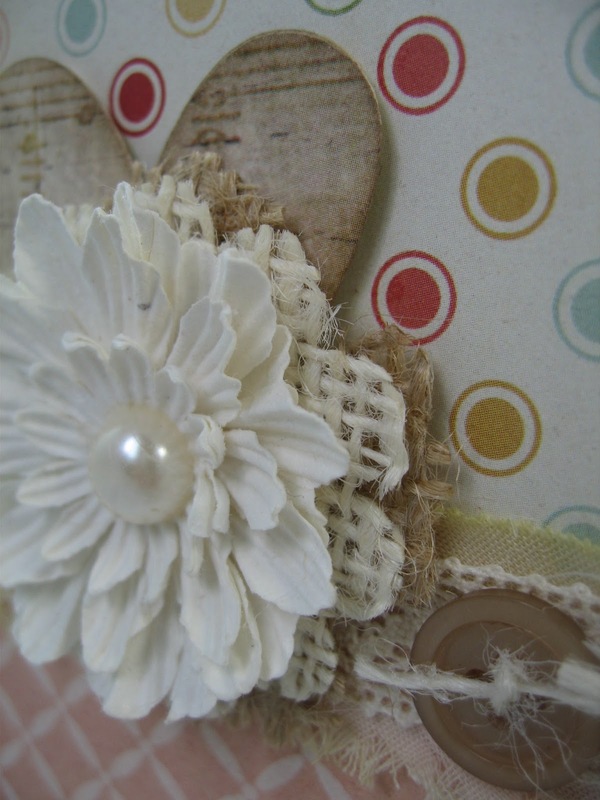 The layers of flower and burlap are gorgeous!